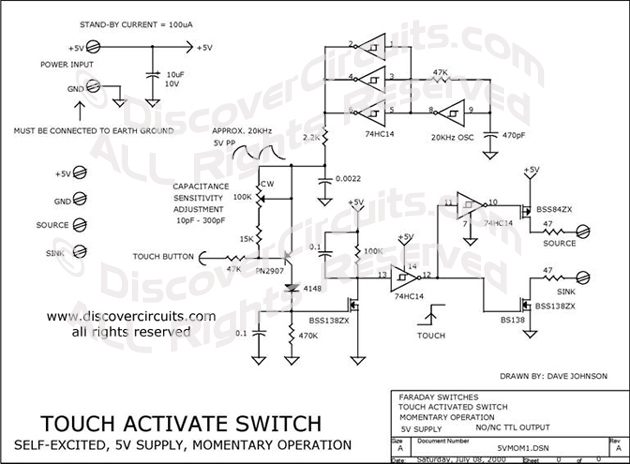 Circuit: 5V CAPACITANCE TOUCH ACTIVATED MOMENTARY SWITCH __ Circuit designed by David A. Johnson, P.E. This circuit is discussed in more detail in the section on Capacitance Proximity Switch Technology. The circuit is powered from a standard +5v supply. It has both a source and sink output that change state whenever a metal button connected to the circuit is touched. An earth ground reference is required.